Rear-end collisions are the most common kinds of car accidents in Tennessee. 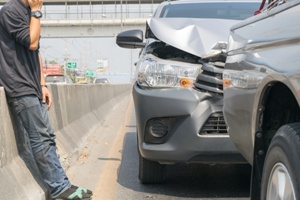 Although they are also known as “fender benders,” rear-end accidents can cause a significant amount of damage as one car barrels into the back of another. Even at speeds under 10mph, when a car is struck from behind, the driver and passengers can suffer neck and soft tissue injuries—some of which may not show symptoms until hours or days after the crash. It is vital for injury victims to seek medical attention as quickly as possible after an accident occurs. Many victims simply want to go home, allowing the adrenaline to override any pain symptoms so that they can get away from the accident scene. However, injuries sustained from a rear-end collision may not be immediately apparent, and can be harder to treat weeks after the event. Whiplash. Most people are aware of whiplash, the neck injury that occurs as the head is suddenly thrown forward and then backward in a rear-end collision. What people may not realize is that this action can cause muscle damage, stretching of the tendons, spinal injury, concussion, and nerve damage, making the injury far from minor. Head trauma. A person’s head may strike the headrest, window, steering wheel, or airbag in a rear-end collision, putting him or her at risk of traumatic brain injury (TBI). There are several degrees of TBI, and like whiplash, it can take days for the full effects of the injury to become apparent. Symptoms of TBI may include loss of consciousness, fatigue, dizziness, mood swings, slurred speech, memory loss, or impaired cognitive function. These injuries take time and careful treatment to heal, and some effects may be permanent. Facial scarring or disfigurement. A victim’s face may collide with airbag or be lacerated by broken glass or dashboard fragments, resulting in deep cuts or burns that cause permanent scarring and disfigurement. Fractures. Broken bones are one of the most common injuries suffered in car accidents. In rear-end accidents, drivers and passengers often suffer breaks in their fingers, feet, and hands as they brace for an impact, as well as in their spine or ribcage as a result of being held in place by seat belts. Paralysis. Severe trauma to the back, neck, and spine carries the risk of partial or total paralysis. An injury to the cervical spine (immediately below the neck) can often result in quadriplegia, the inability to move the arms and the legs. When a rear-end accident occurs between two cars, the person in the rear car is usually found to be at fault. However, Tennessee’s comparative negligence laws may make it more difficult for the injured victims who were rear-ended to get compensation, since they could potentially receive less in a settlement if they shared blame for the accident. It is important to note that rear-end collisions are particularly dangerous when they involve bicycles or motorcycles. When a car hits the back of a bike, the rider is not simply jolted forward, but flipped or thrown from the bike. Both motorcyclists and bicyclists have very little protection when they are hit on the back wheel, and are more likely to suffer permanent or even fatal injuries as a result. Even a so-called “minor” accident can cost a victim thousands of dollars in hospital bills, physical rehabilitation, and ongoing medical appointments. During this time, victims are often unable to work, making it even more difficult for victims and their families to recover and put the accident behind them. If you have suffered significant losses as a result of a collision, our Tennessee attorneys can help you get the compensation you deserve. Fill out our online contact form today to schedule a free, no-obligation consultation with our legal team.